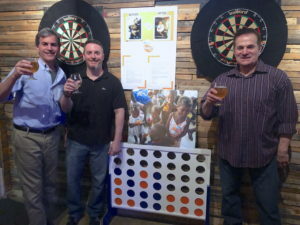 Hope Hops™ is a startup collaboration between South Florida businesses, Prosperity Brewers, Tilted Kilt Pub & Eatery and Hope Gel, Inc. to fight childhood malnutrition. 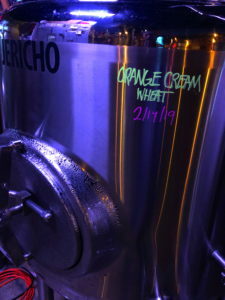 Prosperity Brewers has developed a great-tasting Hefeweizen style craft beer called Hef’In Orange Cream, which will be sold initially in its brewery as well as Tilted Kilt with proceeds from sales going to Hope Gel, Inc. to produce more Hope Gels. For more information and/or if you own a sports bar/restaurant and might be interested in Hope Hops to help feed malnourished children, please contact us. Hope Gel Partnered With Jersey Mike’s Subs in Boca Raton, FL In November, 2018 and Raised Over $1500 – Thanks Jersey Mikes!! 100 % of Donations Went Towards Making More Hope Gel! 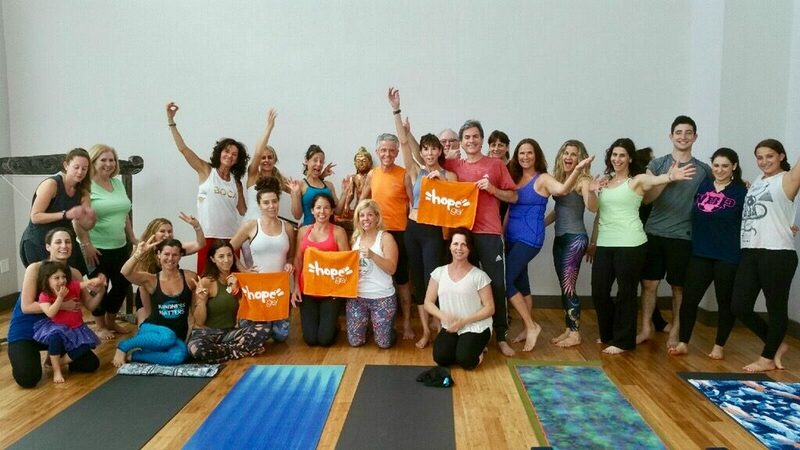 2nd Annual “Yoga For a Cause” to benefit Hope Gel was held at Evolution Yoga in Coconut Creek, Florida on September 23rd, 2018. Over $2000 Raised! 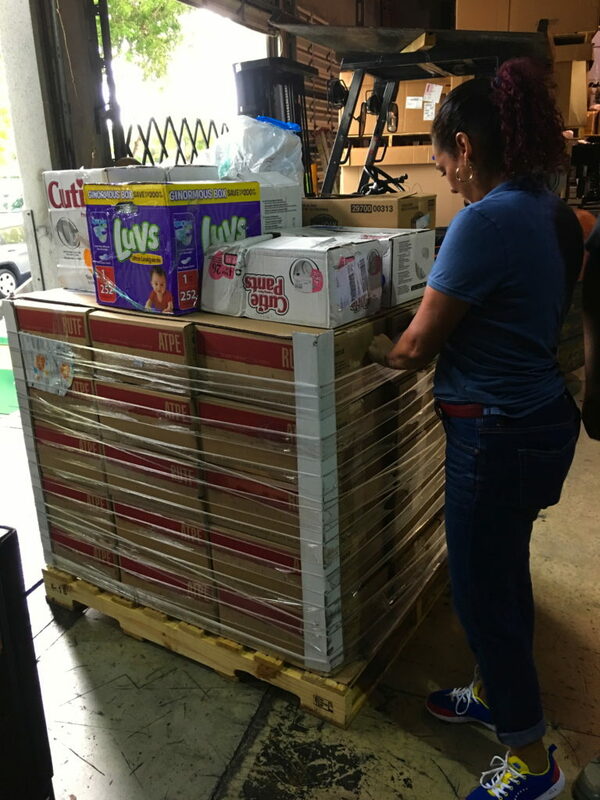 Connie Pinero of Programa de Ayuda Humanitaria para Venezuela prepares a recently donated pallet of Hope Gel in their Miami warehouse about to be shipped down to Venezuela. In this video, Angel Rojas and Connie Pinero of Programa de Ayuda Humanitaria para Venezuela explain the dire need to combat starvation in Venezuela. Hope Gel Has Been Accepted As An Official Participating Charity By The Amazon Smile Foundation! Donate to Hope Gel every time you shop on Amazon simply by using the URL smile.amazon.com and making Hope Gel the designated charity. You must make purchases through this URL and can continue to use your Amazon account as usual. Or you can bookmark Hope Gel’s unique charity link https://smile.amazon.com/ch/82-2336727 and your Amazon account will be linked automatically. Happy shopping for a great cause! South Florida Journal Interviews HopeGel® Team and Food For The Poor! Natalie Tribbey, a senior studying to obtain her BA with a major in Multimedia Journalism at Florida Atlantic University, interviewed the Hope Gel team and Mark Khouri, Vice President of Food For The Poor to learn more about their backstory and mission. The interview was published in the South Florida Journal, a weekly podcast that broadcasts every Friday and focuses on news concerning Broward and Palm Beach County. The podcast is produced by Dr. Kevin Petrich and students taking his two Broadcast Journalism classes held at FAU for nine weeks every spring and fall semester. Dr. Jeffrey Miller of the HopeGel team in Boca Raton, Fla., traveled with Food For The Poor in August to visit two nutritional centers in Guatemala to see how children are benefiting from HopeGel. COCONUT CREEK, Fla. (Nov. 2, 2017) – For malnourished children in Guatemala, hope arrives in a small, lightweight packet. 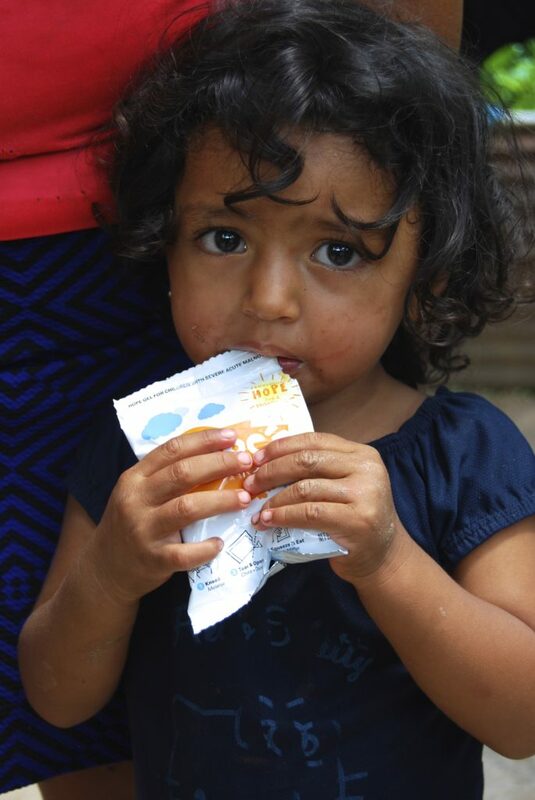 In these packets, the children receive the lifesaving nutrition they need to not only survive, but thrive, thanks to HopeGel®, which is working through Food For The Poor. The HopeGel® team in Boca Raton, Fla., has supplied more than 34,000 packets to two nutritional centers in Guatemala through the charity and plans to send packets to two more centers. HopeGel® is a nutritional packet, fortified with vital lifesaving protein, vitamins, minerals, good fats and desperately needed calories. It can be eaten straight out of a small disposable pouch and does not need to be refrigerated, cooked or mixed with water. The flavor, which is described as a combination of peanut butter and orange creamsicle, has been readily accepted by the children. In August, Dr. Jeffrey Miller, a urologist at Boca Raton Regional Hospital, his wife, nurse Rachel Miller, and their daughter, Amanda, traveled with Food For The Poor to Guatemala to see how children have benefitted from the nutritional packets. 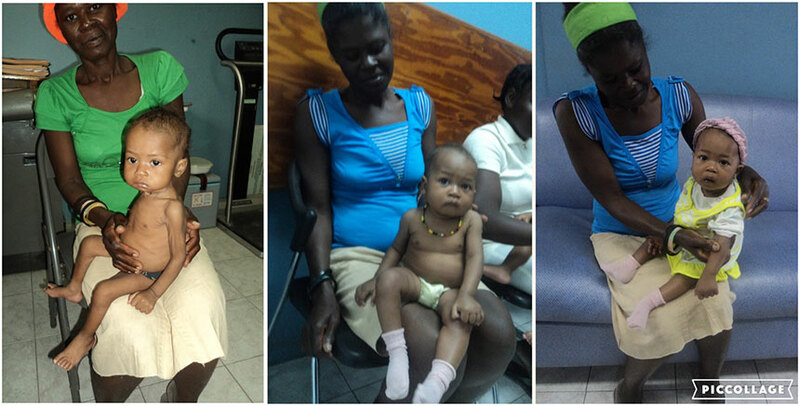 Before the children were given the HopeGel®, staff at the nutritional centers noted they were lethargic. They were so malnourished, they did not want to eat. Guatemala suffers from one of the worst rates of chronic malnutrition in the world. At a young age, it can lead to stunting, a condition that affects both physical growth and brain development, according to the U.S. Agency for International Development. The most vulnerable are the Mayan communities who live in the highlands, where stunting affects almost 70 percent of children younger than 5. At Sister Edna’s Nutritional Center, HopeGel® has been given to children as well as distributed around the village to breastfeeding and expectant mothers and even malnourished adults. At Sor Lucia Roge Nutritional Center in Guatemala City, children spread the HopeGel® like peanut butter on bread twice a day. On average, 40 children every month are receiving the lifesaving nourishment at both nutritional centers and in the surrounding communities. Young patients must eat one to two packets a day until they return to a normal weight, which typically occurs between three and six months. To view a video of Miller’s visit to Sister Edna’s Nutritional Center, please go to www.FoodForThePoor.org/hopegel. HopeGel® was started in 2012 by Dr. Nathan Feldman and Daniel Schapiro, founders of EB Performance, a South Florida-based functional beverage company, in partnership with Miller and the Boca Raton Regional Hospital Foundation to address the global issue of severe acute malnutrition in children. HopeGel® is a “ready-to-use therapeutic food” that meets standards for supplements designed for specific, usually nutritional, therapeutic purposes. The HopeGel® team and Food For The Poor previously have teamed up to distribute more than 33,000 nutritional packets to malnourished children in Haiti. Food For The Poor, one of the largest international relief and development organizations in the nation, does much more than feed millions of the hungry poor primarily in 17 countries of the Caribbean and Latin America. This interdenominational Christian ministry provides emergency relief assistance, clean water, medicines, educational materials, homes, support for orphans and the aged, skills training and micro-enterprise development assistance. Over the last 10 years, fundraising and other administrative costs averaged less than 5% of our expenses; more than 95% of all donations went directly to programs that help the poor. For more information, please visit www.FoodForThePoor.org. 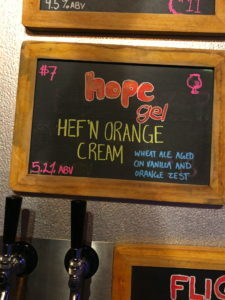 Hope Gel is a 501(c)(3) Corporation. Contributions are tax-deductible under Internal Revenue Code Section 501(c)(3).